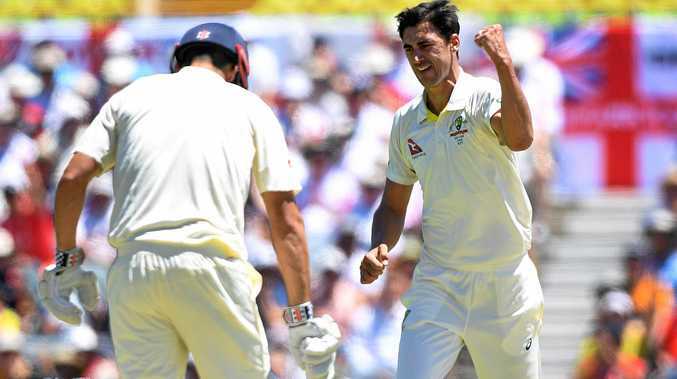 TEST quick Mitchell Starc has been cleared of major foot damage but remains in doubt for the Boxing Day Test with a bruised heel. Starc had scans on Wednesday in Sydney after leaving Perth on crutches following Australia's win in the third Test. He spent Tuesday night with his foot in an ice bucket in a desperate bid to be ready for Boxing Day. Scans revealed he had no cracks but his heel was badly bruised and Jackson Bird remains the likely replacement should Starc not recover in time. Starc is the leading wicket taker in the Ashes so far with 19 and told captain Steve Smith he wanted to play in Melbourne. But with a heavy summer schedule of limited overs cricket to come before a four-Test tour of South Africa in March, caution may be the order of the day. "He was a little bit sore. He said it didn't get any worse when he was bowling,” Smith said in Perth. "That's something we have to sum up. We've wrapped the series up here. "We'd love to win 5-0 and have the big three (Starc, Pat Cummins, Josh Hazlewood) going all the time. "But we've also got an important tour to South Africa after this series, which we'd love to have him available for. Players regard Boxing Day and the SCG Tests as the pinnacle, and being part of an Ashes whitewash is a rare achievement. However, selectors may also think there's bigger fish to fry now that the series has been locked up. There's an important South African Test tour around the corner. Beating South Africa on similar pitches to what this Ashes has been played on will require Australia's outstanding pace bowling attack firing on all cylinders. As Starc's "ball of the century” delivery at the WACA showed, there is no bowler in world cricket capable of his lethal pace, swing and bounce. Bird hasn't played a Test match since the corresponding MCG match against Pakistan last year, however, he has been in superb form in the Sheffield Shield. The ultra-consistent right-armer has taken 25 wickets in four matches this season, including a barnstorming five-wicket haul for Tasmania against South Australia. Bird averages 27 with the ball in Test cricket and has taken 20 wickets in his past four Tests. Bird, a man who this year toured India and Bangladesh without getting a single game. In India, Australia preferred to call Pat Cummins over to replace an injured Starc after two Tests, and in Bangladesh selectors controversially called in spinner Steve O'Keefe for the second Test to replace Josh Hazlewood who had broken down with a side strain. It meant selectors went with Cummins as the only quick, leaving Bird once again mixing drinks.